Overall gross rental yields in Singapore for non-landed private homes are around 3.2%, the lowest in a decade. Low interest rates, a tightening labour market and a large housing supply are possible reasons. However, there were projects that managed to command attractive rental yields of 4% and above in 2017. In our analysis, we have identified apartments and condominiums with the highest gross rental yields in the Core Central Region (CCR), Rest of Central Region (RCR) and Outside Central Region (OCR). Current gross rental yields are calculated by taking the annual rental income of the development and dividing it by recent resale prices of the corresponding project. To mitigate the effects of outliers which may skew rental yields, we only considered major projects with 100 units and above, and projects with at least five sales and five rental transactions in 2H2017. However, it is important to note that these are gross rental yields, and do not include other costs such as vacancy costs and maintenance fees, etc. Suites at Orchard is among the highest-yielding properties in the prime districts. The Interlace tops the list as the highest-yielding project in the city-fringes. Melville Park has an estimated gross rental yield of 4.29%, the highest in the Outside Central Region. Leasehold properties are typically considered to be more attractive when comparing rental yields. This is due to a lower relative $ psf when buying a 99-year leasehold property compared to freehold, assuming that all other things are equal. In general, tenants are not concerned about the tenure of a property, so leasehold properties do tend to have an advantage over their freehold counterparts when looking purely at rental yields. Notably, prime district properties located within walking distance to a MRT station commanded higher rental yields (we define walking distance as 500m, which should be roughly within five minutes walking time). This is understandable, as tenants could be foreigners or expats who do not own a car, and who are working in vicinity of the central business district (CBD). At the end of the day, it is important to note that rental yield is just one part of the total return of investment equation. When considering real estate investment, it pays also to look at capital growth potential. For instance, the lower the purchase price, the higher the potential for upside, and the higher the likelihood that rental yields will be favourable - such as this list of winning developments that took home the EdgeProp Value Creation Award based on capital appreciation and rental returns. Read on for more! Which Properties Can You Buy With $13.6 million? Will there be more million-dollar HDB transactions in 2019? Here is more evidence why properties located in the city fringe or near regional centres may be investors’ best bets, at least in terms of capital appreciation. In this study, we identified 10 projects with the highest capital appreciation between 2010 and 2015. Most of them were either in the central region or near regional centres. Another attribute driving price appreciation is first-mover advantage, which is related to timing. The study compared the average transacted price of private non-landed projects between 2010 and 2015 by size and those with at least three transactions. For homes ranging from 700 to 900 sq ft, the top 10 projects in terms of price appreciation were Caspian (37%), Hougang Green (31%), The Gardens at Bishan (30%), Kemaman Point (29%), Tanglin Regency (27%), Waterbank at Dakota (25%), Regent Park (23%), NV Residences (22%), Waterview (21%) and City Square Residences (21%) (see Table 1). Of these, eight were located near the city centre or regional centres. The top-performing project, Caspian, is a condominium near the Lakeside MRT station and Jurong Lake. The project rode on the development of the Jurong Regional Centre, which was designated as a lakeside business and leisure destination. The average price for 700 to 900 sq ft units at the project rose from $814 psf in 2010 to $1,118 psf in 2015. Separately, the top 10 projects for homes ranging between 900 and 1,100 sq ft were Atrium Residences (35%), Double Bay Residences (35%), The Wharf Residence (34%), Signature Park (33%), Trevista (30%), Parc Vista (29%), Hillington Green (29%), Regentville (29%), Simsville (28%) and The Centris (27%) (see Table 2). Again, eight of them were located near the city centre or regional centres. Atrium Residences is located on Geylang Road in the city fringe and Double Bay Residences near the Simei MRT station and Tampines Regional Centre. Sixteen of the 20 top-performing projects got a price boost from new launches in the vicinity. Parc Vista, Caspian and The Centris, for example, rode on the coat-tails of new launches, including Lakefront Residences, Lakeville and J-Gateway. Lakefront Residences was launched in 2010 at an average price of $1,069 psf, at least 30% higher than the average sale prices of Parc Vista, Caspian and The Centris, which hovered in the $650 to $820 psf region in 2010. Subsequent launches in the area included Lakeville in 2014, at an average price of $1,325 psf. Separately, J-Gateway in Jurong East averaged $1,493 psf during its sellout launch in 2013. Another example of projects benefiting from new launches in its vicinity is Tanglin Regency. 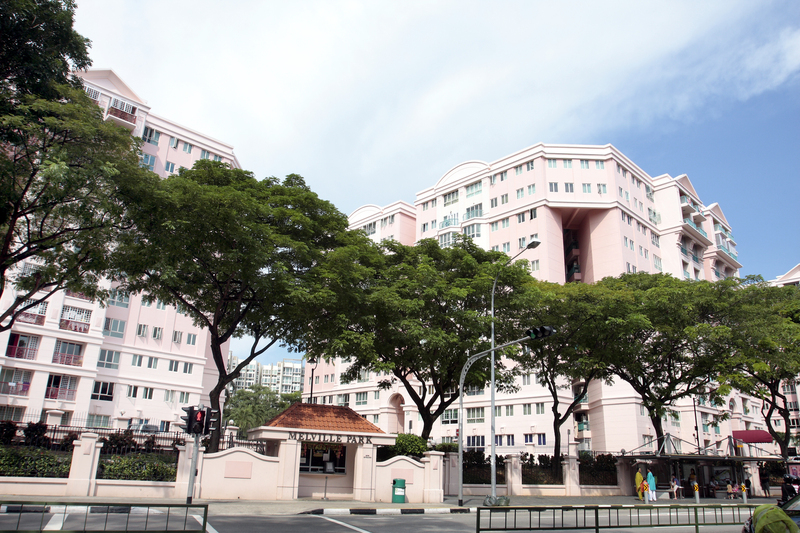 Following the launch of Ascentia Sky in 2010 at an average price of $1,321 psf, the average price at Tanglin Regency surged by 17% over a one-year period, from $1,029 psf in 2010 to $1,203 psf in 2011. Ensuing launches in the area continued to propel prices in the area. Alex Residences was launched in 2013 at $1,698 psf on average, while The Crest was launched at an average price of $1,762 psf in 2014. Over in Toa Payoh, Trevista could possibly have got a price boost from Sky Habitat in Bishan. Following the launch of Sky Habitat in 2012, which averaged $1,604 psf, the average price at Trevista rose 12% from $1,258 psf in 2012 to $1,412 psf in 2013. Ultimately, the best-performing projects bear a combination of at least three desirable attributes. Besides a strategic location and first-mover advantage, they might be located near transportation nodes or popular schools, carry freehold tenure or offer a park or waterfront lifestyle. Caspian, for example, is located near Lakeside MRT station, Jurong Lake and the Canadian International School. The Gardens at Bishan is located next to the upcoming Bright Hill MRT station as well as within 1km of Ai Tong Primary School. In yet another example, Waterbank at Dakota is a stone’s throw from the Dakota MRT station and within 1km of Kong Hwa Primary School. Start browsing for listings at Caspian and Atrium Residences. This article appeared in The Edge Property Pullout, Issue 710 (January 11, 2016) of The Edge Singapore. Does the MRT network affect private non-landed residential rents? Property investors seeking opportunities in the bearish residential property market need to look beyond capital appreciation as poor market sentiments continue to prevail. Though seemingly attractive deals may be available in today’s languid market, a prudent purchase is likely to be a wiser investment. Quick gains will be tough to come by as demand for residential properties falls due to tighter lending rules. Prices are also expected to face downward pressures due to a strong pipeline of newly completed projects entering the secondary market. Transaction volume in the non-landed housing segment fell by 53.6% q-o-q in 3Q14 as a result of a lackluster primary market (Table 1). Price correction in 3Q14 is more pronounced for completed units where overall prices dropped by 4.3% y-o-y as compared to 2.6% y-o-y in the primary market. Prices saw the greatest dip in the Orchard area where overall median price in the secondary market fell by 38.8% in 3Q14. Rental volume surged by 13.1% q-o-q and 11.8% y-o-y to 16,050 rental contracts signed in 3Q14, the highest since 2000. Median rent, however, remained relatively stagnant at around $3.7 psf pm, a level since 3Q12. Overall rental price index fell by 1.1% q-o-q and 2.2% y-o-y with the largest correction in CCR followed by OCR and RCR (Table 2). Notably, rental contracts in CCR increased by 25% q-o-q in 3Q14 to a 5-year record high of 5,425 records even though the region had the highest price correction. The rental market is likely to remain competitive in the short run due to an avalanche of supply from completing projects launched since 2010 coupled with stricter hiring policies for foreign talents. With a reduction of expatriate hiring and housing allowance by companies, rental compression is likely to persist. Ranked by rental yield, these are the top 5 developments with at least 30 rental contracts and 4 sales transactions recorded in the past 2 quarters (2Q14 and 3Q14). Topping the chart with a median rental yield of 7.1% is this fairly new freehold development located near East Coast Park in district 15. Completed in 2012, Suites @ Eastcoast consists of 116 units of which 57% are shoebox units (unit area below 500 sqft). A total of 6 sales and 31 rental contracts were transacted in the last 2 quarters with a median rent and price of $6.00 psf pm and $1,018 psf. With the construction of the Thomson-East Coast Line, Suites @ East Coast will stand to benefit from the upcoming Siglap MRT Station, slated to be completed in 2023. Privatised in 2002, the exact completion date of this development is unknown although we do know its 101-year tenure begin in 1985. 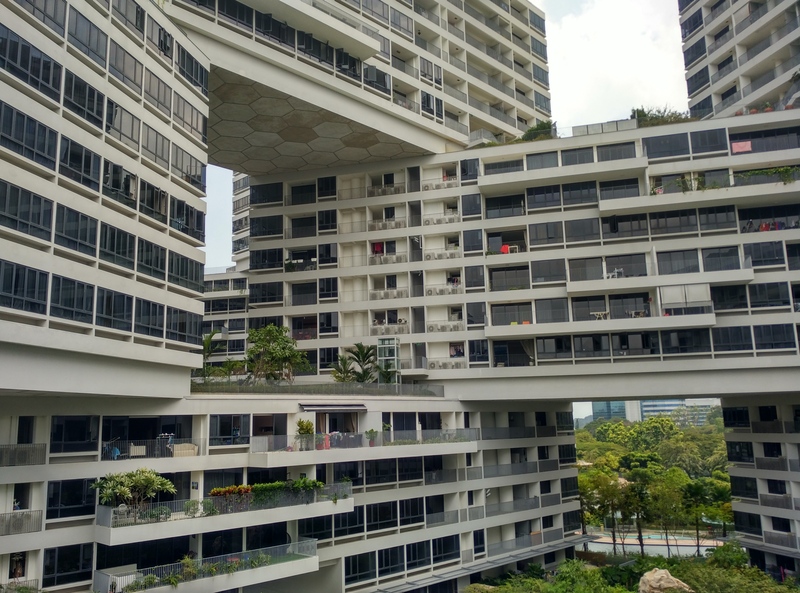 Comprising 560 spacious units ranging from 1,300 sqft onwards, this old development has braved through a total of 2 failed en-bloc attempts, one in 2006 and the other in 2011. Tampines Court is located in the outskirt at district 18. Located near industrial buildings which may be the source of demand for rental units in the vicinity, Tampines Court has recorded 46 rental contracts and 6 sales transactions with a median price of $2.07 psf pm and $532psf in the past 2 quarters. Coming in second is Tampines Court at a median rental yield of 4.7%. Also situated nearby industrial development, Park West rented out a 48 of its 432 units in the past 2 quarters at a median rent of $2.90 psf pm. A total of 4 sales transactions were recorded during the same period at a median price of $753 psf. This 99-year tenure development was completed in 1986 and is currently one of the oldest and most inexpensive development available in the vicinity. Park West ranks third with a median rental yield of 4.62%. Coming in fourth is Icon, a development located in CCR, Downtown Core, and is just 225m away from Tanjong Pagar MRT station. Developed by Far East Organization, this development comprises a total of 616 units and was completed in 2007. A total of 380 rental contracts, representing 58% of its total units, were recorded in a 12-month period from 4Q13 to 3Q14. The median rent and median price from 186 rental contracts and 4 sales transactions recorded in the past 2 quarters is $6.62 psf pm and $1,730 psf. Icon comes in fourth with a rental yield of 4.6%. Situated in district 16 just beside Bedok Reservoir, Aquarius by the Park will soon benefit from the Bedok Reservoir Station (DTL), which is slated to be completed in 2017. Comprising 720 units, this development was completed in 2001 and saw a total of 50 rental contracts and 10 sales transactions in the past 2 quarters with median rent and median price of $3.05 psf pm and $819 psf. Aquarius by the Park ranks fifth with a rental yield of 4.5%. How did the private rental market perform this year?